To mark the 75th anniversary of D-Day in 2019 around 2,000 of the Army's Cadets - ACF and CCF (Army) - will have the opportunity to travel to France to take part in an exciting and informative battlefield experience and commemorative event. 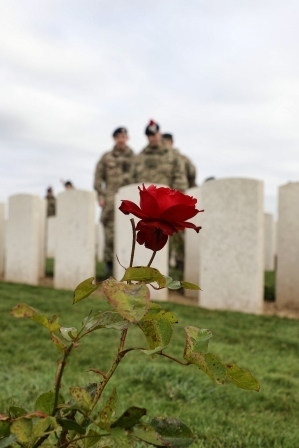 During the May/June half-term holiday cadets from around the UK will be taking part in a series of one-day D-Day Battlefield events (on 26, 28, 30 May, and 1 June 2019). In order to take part, the four groups of cadets will travel from Cadet Unit locations via Dover and Calais the day before the scheduled event and return the following day (camping before and after the event). On each of the visits the cadets will tour six carefully selected stands accompanied by expert guides to learn about a range of (curriculum coordinated) themes including: the causes of the war, the course of the war, the context for D-Day, technology (including tanks, engineering, aircraft, sea-craft, artillery, and radio) (STEM), media, medicine, and logistics. Each event will culminate in a commemorative parade, probably at Arromanches overlooking GOLD Beach. The whole will be supported by a bespoke Commemorative Booklet which will provide the history and context, illustrate each of the themes, and underpin the stands with further detail. Counties that are interested in taking part can find further details on Westminster. Look out for further information for cadets and adults on how to sign up to take part.